I am back! After moving to California and trading full-time the past two years, I have decided to start putting out the Trade Report again. I am working with Kunal at BullsonWallStreet. Subscriptions to the report should start in a week or two. In the meantime, check out the first sample Report. Contact me or BullsonWallstreet for more information. SPY is at all time highs, but volume and divergence is a concern. Good low risk short, even if probability is only 50/50. NFLX and JAKK are long setups to focus on in coming days. Watchlist is mostly green. Market leaders more than doubled market gains, but like market on low volume. ETFs show money is flowing into new sectors short term. Watch oil and India for positive money flow, while natural gas could break down. No current trades. 181-184: plenty of buying in this range. Price action is positive and at a record high. Pivot levels still maintain the “higher high, higher low” pattern, which is necessary for an uptrend. However, the volume pattern shows distribution. Notice that during the uptrend positive volume was stronger than negative volume. Now, negative volume outpaces positive. Notice that today’s price bar, while up strong, is on average volume. We would have preferred to see volume pick up today. 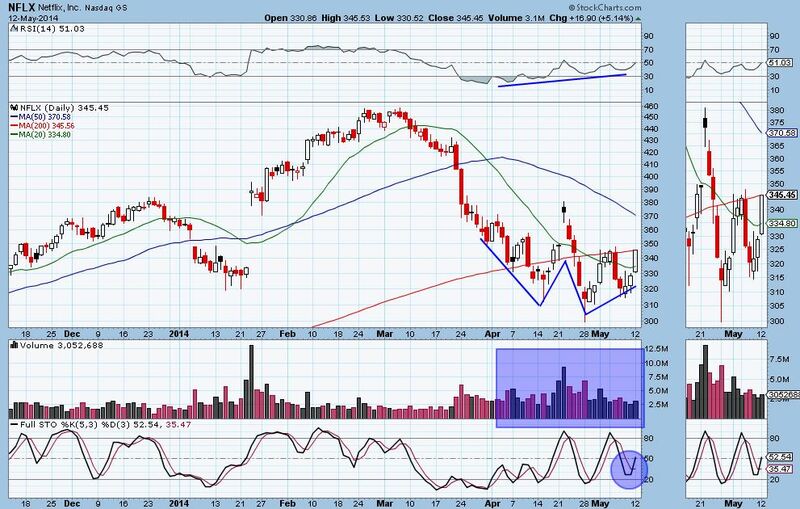 The volume pattern, along with the RSI divergence, is cause for pause if thinking of going long. Does this mean price can’t break this resistance level? No. However, it does increase the probability of either 1) price stalling at resistance or 2) a failed breakout if price does push through resistance. T2108 and A/D line are neutral. Market ETFs can be played in either direction. I am leaning toward shorting SPY at these levels. The easily defined risk parameters, along with what’s taking place under the hood, provides a better than 50/50 probability of success along with great risk measures. A short entry under $190, with a stop at 191 and target near the recent low at $182 provides a 4:1 risk ratio. If I short SPY with 100 shares, I am risking around $100 in order to make $400. Even with a less than 50 percent probability that’s a trade I want to take. If price breaks 190-191, we re-evaluate. Key points will be strength of price and volume action at breakout and breadth indicators. Individual equities and sector ETFs can be played according to setups without regard for the market. I will try to have a few shorts and a few longs. 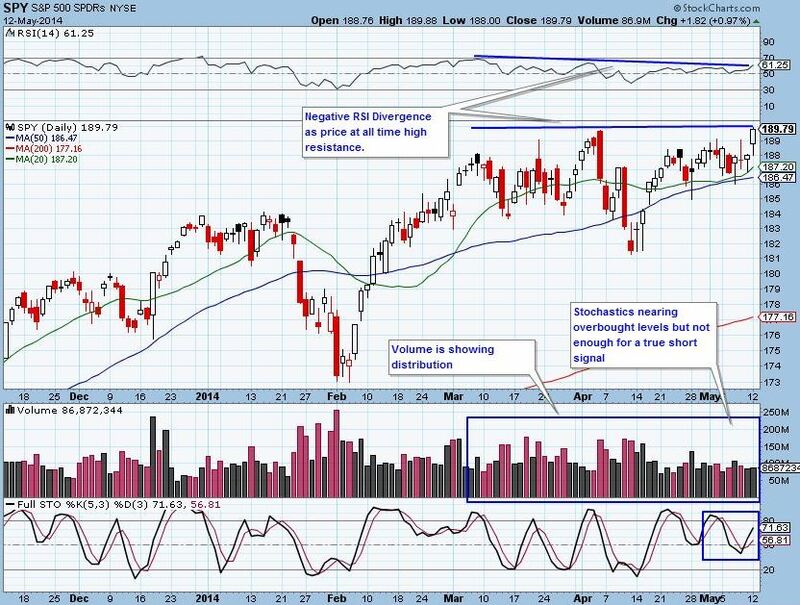 Here we find actionable setups culled from “the watchlist” for the coming trading day. JAKK has been trending strongly toward the late July breakdown gap. These types of gaps tend to eventually get filled, and JAKK recently did just that in April (a textbook short term short setup). A pullback here is good for a long entry. 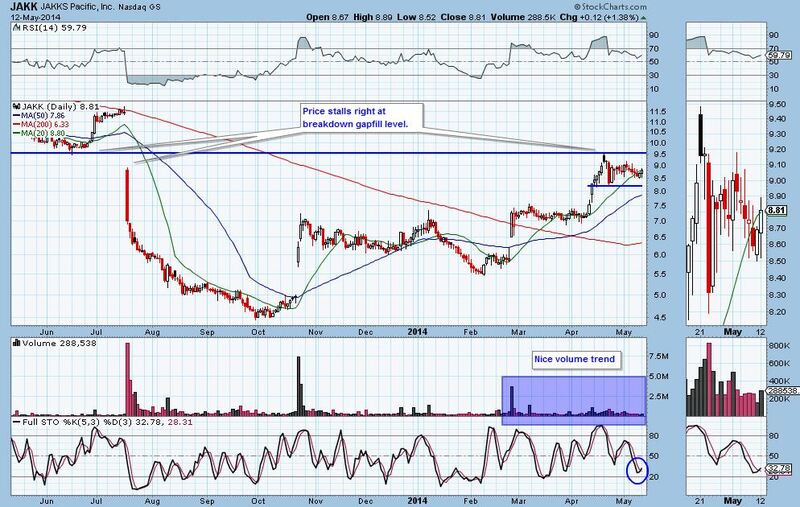 I will place a stop under the recent lows at $8.15 with a target at the recent high of $9.40. An entry at $8.55 provides a 2:1 risk ratio. 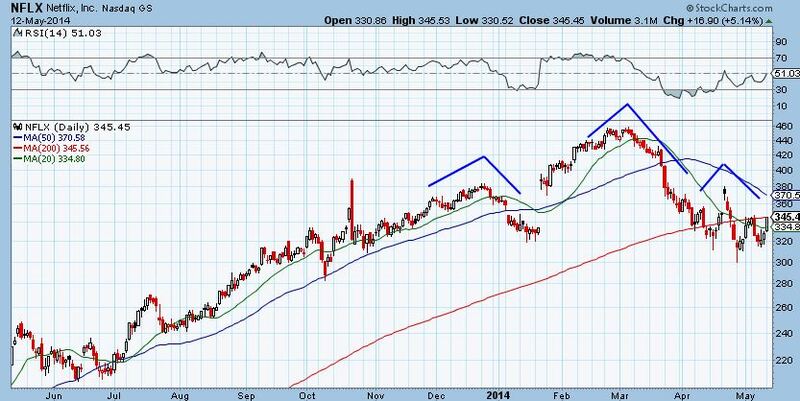 NFLX is a setup that, while not classic, shows potential for big gains. We see a “W” style bottoming formation and a strong positive RSI divergence. The volume pattern within the trading range is positive. This is a tricky trade for two reasons. First, the 200 day moving average is right above the current price, and 25 points away is the 50 day moving average. This could provide resistance. Second, zooming out to the 1 year chart shows a larger topping pattern. However, with proper risk and trade management, this trade provides great upside with minimal risk. An entry on pullback of today’s up bar (say $337), with a stop around $310 and initial target near the 50 day ma at $370 provides a risk ratio at around 1.4:1. I usually like to be at least 2:1, however here I make an exception because of the potential if the 50 day ma breaks (which would also break the right shoulder of the longer time frame head and shoulder formation). If that happens, there is a possibility of nearing the high at $460. This is where trade management comes in. At $370, I exit half the position and move my stop up to entry. We now “let the trade ride”, as we have locked in gains and have the potential for much more. That possibility here makes the low 1:4 to 1 risk and the bearish pattern on the larger time frame okay. 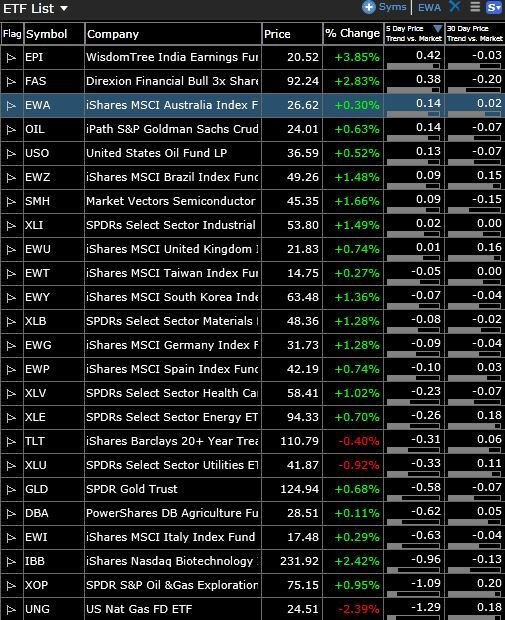 It is no surprise that on a strong day like today the watchlist was mostly in the green. A whopping 58 of 69 watchlist stocks were postive today, and only 2 were down more than 1 percent. These are stocks that I always watch, though they might not be in my tradeable watchlist, nor are they actually always leading the market (TSLA and NFLX certainly haven’t in recent months). Today they did lead. Notice that while SPY was up .97% today, all but CAT at least doubled SPY’s gains. Is this a good sign for the market? It could be, though like the market itself, gains were on low volume. This list of “watchlist” ETFs is used a number of ways. Most are market leading ETFs that I use to find watchlist stocks using a “top down” approach. You’ll notice in my watchlist that a number of stocks come from healthcare. materials and energy, sectors that are represented here. I also trade ETFs that have good setups. Finally, following sector ETFs can give you an idea of where money is flowing and an overall gauge of the market. I carefully watch the 5 and 30 day price trends versus the market. This gives me an idea of where money was and is flowing. For instance, over the last 30 days India is slightly lagging the market, while over the last 5 days it is leading by a big margin. This lets us know that money is flowing here. The oil ETFs, OIL and USO are good examples of this, having a 3o day number at negative.07 while the 5 day is .13. It is time to watch OIL more closely. On the opposite side of the spectrum, UNG (natural gas) was a big leader, but over the past five days money has flowed out of the sector. Since this is the first report, there are no current trades. However, I am short SPY near close today and long UA. WINNING short term swing and momentum traders are patient. A big reason so many traders fail is because they over-trade and micromanage there positions. A trader must be patient with your entry points and give positions the time they need to work. I know it sounds like a basic principle, however, due to human greed and evolutionary psychology it is a tough one to master. Early in my trading career, I spent many evening researching my watchlist and identifying the perfect entry points, only to jump the gun the next morning and enter before my entry point hit. Inevitably the stock would end up reaching the entry point I originally identified and take time to get back up to my buy-point, if at all. A trader must not fear missing out on a trade. If the buy-point is not hit, that’s okay. There are always more trades. WHEN USING STOCKS IN THE FOCUS LIST, ONLY ENTER IF THE PARAMETERS DISCUSSED ARE HIT. ONCE IN A TRADE, UNLESS SOMETHING MAJOR CHANGES, STICK WITH YOUR PREDEFINED TARGET AND STOP BEFORE EXITING. There’s likely a very good reason that I identified a certain entry point, possibly a pullback to breakout level or a trendline tag of support. By succumbing to emotion and entering early, you will lower the reward to risk ratio. Over time, these lower risk ratios will take you from becoming a very successful trader to an at best average trader. A good trader must also exercise patience once in a position. I can’t stress enough how important it is to let your positions work for you. Just as with entry points, there is a logical reason for setting your stop just below support levels, and targets that are 2X bigger than the stop level. By “micro-managing” your trades, you will end up losing out on big gains. You will also fall into the trap of having small gains and big losses. I’ve always said small losses are great. Small gains are not. Embrace small losses. Many average and unsuccessful traders are great stock pickers. Trading is not stock picking. A good trader identifies setups, finds good entries, manages risk, and enters and exits according to plan. Risk. Trade Management. Setups. In that order. Enjoy this post? Over the next two weeks we will be rolling out a new swing trading service with Paul Singh. To learn more, emailinfo@bullson.ws!